I've blogged previously about enumerations as part of our Excel VBA tutorial, but never knew you could loop over them! This blog was inspired by someone describing Andrew - a fellow blogger at Wise Owl - as "brilliant, fantastic, amazing, and all enumerations on those terms!". 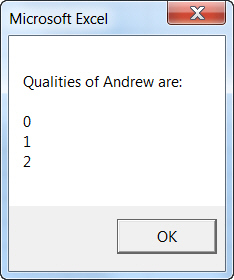 The message box lists out the numerical values of Andrew's qualities. Unfortunately there's no way in VBA of showing the text equivalent for these numerical values, apart from writing your own SELECT CASE statement to return the right text value for each number. For even more tricks with enumerations, go to (who else?) Chip Pearson. Your sample code IS NOT iterating through the values of the enum. All the code does is iterate through all the numbers that exist between Brilliant ( i.e.0) and Amazing (i.e. 2). To prove this assign values to the enums like brilliant = 1 , fantastic = 5 , Amazing = 10. Now when you run the code you should get a return of 1,5,10 BUT YOU DON'T you get a return of 1,2,3,4,5,6,7,8,9,10. So it's not iterating through the 3 enum values it's just spitting out numbers. between 1 and 10. I must admit that's what I had meant, but thanks for clarifying this as I obviously hadn't made myself clear. I must admit in 30+ years of programming I've never had call to do this, but it's nice to know it's possible!